Longtime NASCAR car owner Jack Roush will be honored next week by the North Carolina Motorsports Association. Roush, the winningest car owner in NASCAR history, will perceive the prestigious Achievement in Motorsports Tribute Award, presented annual by the NMPA, at its 12th annual ceremony on Tuesday. One Midwestern city is taking an eye-catching, rotationally molded approach to boost recycling — and is capturing more plastic caps in the process. Mix nostalgic kitsch with environmentalism and you have what locals are calling Cap-etition. Valparaiso, Ind.’s city Public Works Department is teaming up with schools in the city to collect used plastic caps, which often get separated from bottles and end up in the trash. Township High School District 211 in Illinois recently announced it will add 15 propane-fueled 71-passenger buses to its fleet, following the Board of Education’s approval of a bid, which also included the purchase of 15 smaller gasoline-fueled 30-passenger buses. The new buses will replace buses ranging from 13 to 15 years old. Too Cold. Won’t Work. Paying to Warm Up. Now in its third year, our Tour Support Program has become an effective way to help you sell buses. In 2017, we had a 73 percent close rate! A facility tour at ROUSH CleanTech headquarters in Livonia, Michigan, is a great resource to raise customers’ awareness or to educate your employees. Depending on your goals, we can customize the tour’s content to focus on propane, CNG or gasoline school bus sales, technical service or general education. 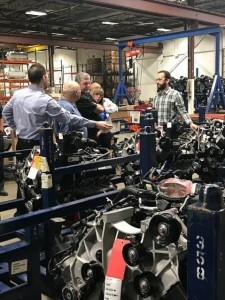 For instance, we recently had Girardin Ontario bring in a group of customers interested in gasoline buses to learn more about that fuel option and the Ford powertrain. Because of this interest, we also took the group to the Ford Windsor engine plant before coming to ROUSH. We want to provide an equal opportunity for all dealers, regardless of location, to visit our factory. To help cover the cost of this tour, we’ll pay a portion of your and your customer’s expenses based on where you’re coming from. Check out the map online here to determine how much we will cover, per person, for visits from your state. Whether you’ve taken this tour before with your staff or a customer, or this is your first time, you’re sure to learn something new, and, more importantly, to increase your odds to close sales. Our calendar is starting to fill up! 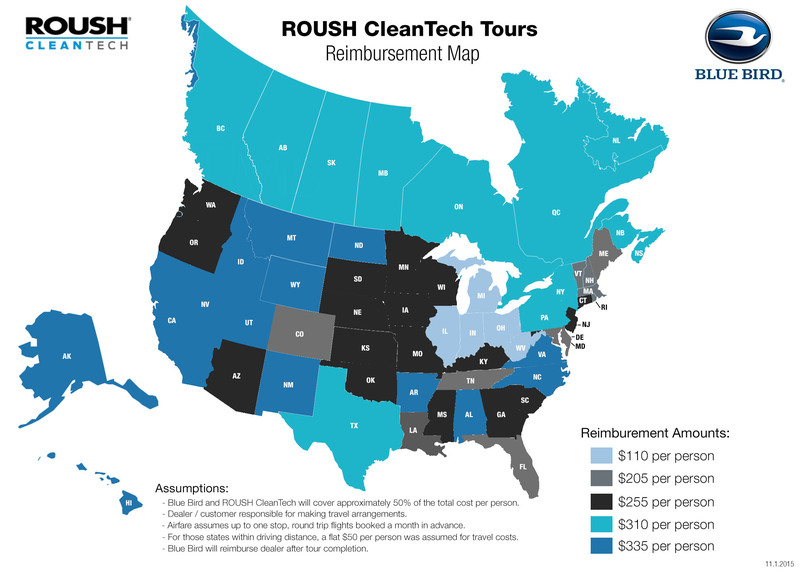 To schedule a tour through our Tour Support Program, call us at 800.59.ROUSH or contact your ROUSH CleanTech rep today. This year, we hope to see continued momentum with the Environmental Mitigation Trust, and possibly see some funds dispersed. Almost all the state beneficiaries have been selected, so you should know who to contact. We still need you to reach out to your state’s beneficiary to schedule meetings and learn what your state plans to do with the money. There is still time to make the case for propane school buses. You can find out your state’s status on the VW Settlement Clearinghouse website. Many state plans are already being published. If you have not reached out to your state’s beneficiary to discuss propane school buses or need additional help in doing so, please contact Chelsea Jenkins at Chelsea.Jenkins@roush.com. She can work with you to develop an outreach plan. And, we created a short video entitled Knock Out NOx to easily explain the importance of removing NOx in school transportation. You can use this video as a part of a presentation, or add the link to your email correspondence. Let’s not lose sight of the potential funding from the $2.9 billion trust that could go toward purchasing our low-NOx propane school buses. If you have any questions about the Volkswagen settlement or the Environmental Mitigation Trust, please contact Chelsea Jenkins at Chelsea.Jenkins@roush.com. You can also visit ROUSHcleantech.com/volkswagen-settlement for regularly updated information. Q. How are propane bus sales going in South Dakota? A. Actually, South Dakota is one of the three states where we don’t have any propane buses right now. That’s why they are such a good target market. 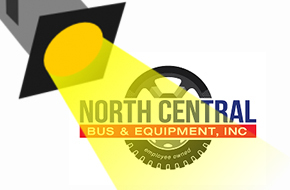 Q.What are you doing at North Central Bus & Equipment to change this? A. I teamed up with Ryan Zic with ROUSH CleanTech and did a sales blitz in South Dakota to see if we could shake out some sales. Q. How did you accomplish this? 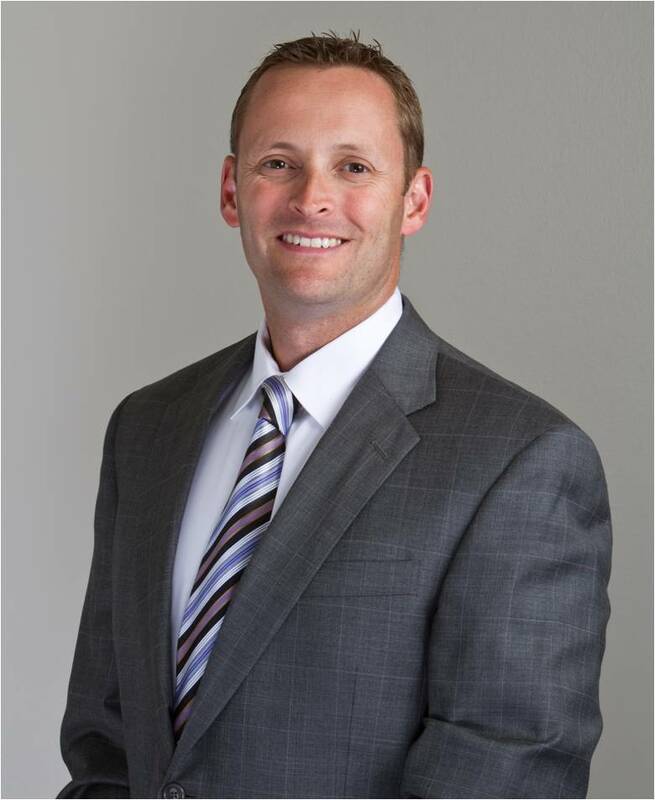 CHS invited customers on the fuel side or in their local depot areas that CHS felt were the folks who would have the most influence over school district decision makers. We developed an itinerary which included a product presentation from ROUSH CleanTech and Blue Bird and a ride and drive event. The fuel providers sat through the presentation, so we were selling to both the district and the fuel provider at the same time. CHS presented on the infrastructure side. Of the 10 people from CHS who attended, we now feel like they are salespeople helping to sell both propane and propane buses. Plus, this event solidified my relationship with the propane provider, and they’ll know who to go to with propane bus questions—and hopefully leads! Q. Did this event lead to any solid leads or sales of propane buses? A. I’m happy to say that we have a few school districts that are very interested in buying our propane buses. I feel like that without the event, South Dakota would still be unaware of this clean-operating, low-NOx propane technology. Blue Bird and ROUSH CleanTech are upping the ante in 2018 to further motivate propane bus sales. 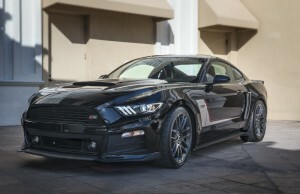 The grand prize is a ROUSH Stage 3 Mustang valued at more than $60,000. For every propane bus you sell starting on November 20, 2017, you automatically earn one entry to win. So far this fiscal year, almost 500 propane school buses have been sold. Great job! We’re also offering giveaways throughout the year to reward your propane bus sales efforts. We’ll pick four winners each quarter to receive a $250 gift card. Earlier this month, Delaware announced it intends to sue the EPA over its lack of action to help curb emissions at power plants in Pennsylvania and West Virginia it claims are creating pollution that’s drifting here. And while the state says those type of emissions are responsible for 90 percent of the ozone in Delaware – DNREC Secretary Shawn Garvin concedes the state can still work to cut emissions in other ways, especially in the area of transportation. If your company, your industry, could benefit from $2.9 billion, how much time would you spend championing the clean-burning attributes of propane? Some industry members have spent the last year exploring how propane could capitalize on funding being made available as a result of Volkswagen’s (VW) 2016 emissions cheating scandal settlement totaling nearly $15 billion. The German automaker was forced to make amends for its violations by funding projects that will lower nitrogen oxide (NOx) emissions across the U.S.